Ryan Mulqueen is a guitarist from the D/FW area. He began his musical studies at the age of 10 when he started to learn the double bass in his elementary school orchestra, and has since then branched off into other genres of music as well as other instruments, taking private lessons and studying music in school throughout. He has also participated in various competitions in festivals, including the 10th Annual Collin College Guitar Competition (where he earned an honorable mention for the high school division), and the UTD Guitar Festival, where his high school guitar ensemble opened for guitarist Eliot Fisk. His passion for music has culminated in his current studies of classical guitar at SMU under the acclaimed guitarist and pedagogue, Robert Guthrie. 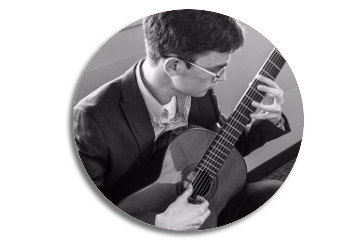 Ryan loves to share music through teaching, and is happy to teach in a variety of styles involving nylon-string, steel-string, and electric guitar. In addition to guitar, he can also teach and play the bass and ukulele.